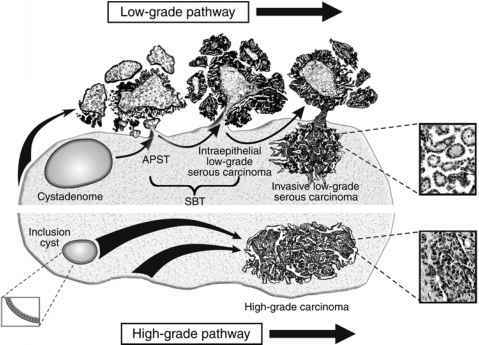 ETT is an unusual type of trophoblastic tumor that is distinct from PSTT and chorio-carcinoma with morphological features resembling a carcinoma (51). Microscopically, ETTs are nodular and generally well circumscribed although focal infiltrative features can be present at the periphery. The tumors are made up of chorionic-type intermediate trophoblastic cells. A characteristic type of geographic cell necrosis is frequently observed. The trophoblastic origin of ETT has been confirmed by a molecular genetic analysis demonstrating that they contain a Y chromosomal locus and/or new (paternal) alleles not present in adjacent normal uterine tissue in all informative cases (37). The molecular features of ETTs are largely unknown, as this tumor has only been recently recognized. The tumors express cytokeratin, epithelial membrane antigen, E-cadherin, and EGF-R consistent with their epithelial origin. In addition, all the tumors are positive for p63, but only focally positive for hPL, p-hCG, and Mel-CAM, an immunophenotype identical to that observed in chorionic-type IT (8,24,50,52). Expression of the p63 gene, a transcription factor belonging to the p53 family, characterizes ETT. As discussed previously, p63 has various isoforms that are classified into two groups designated TA and aNp63 isoforms (8). The TA isoforms have a p53-like suppressor function, whereas the aNp63 isoforms exert an oncogenic effect. Based on immunohistochemistry and reverse transcriptase polymerase chain reaction, it appears that CT expresses the aNp63 isoform, whereas chorionic-type IT in the fetal membranes, placental site nodules, and ETT express the TAp63 isoform. The proliferative activity of ETT is relatively low as the mean Ki-67 labeling index in ETTs is 17.7 ± 4.5% (mean ± standard deviation) with a range from 10 to 25% (51). The expression of cyclin E in ETTs, but not in the majority of placen-tal site nodules (22), suggests that cyclin E probably plays a role in neoplastic transformation of ETT as its oncogenic role had been demonstrated in other neoplastic diseases (53). Because placental site nodules are also made up of chorionic-type intermediate tro-phoblast, it has been hypothesized that some placental site nodules may represent a stage in tumor progression to ETTs. This view is supported by the observations that some proliferative placental site nodules with slightly higher cytological atypia tentatively classified as "atypical placental site nodules" have features intermediate between typical pla-cental site nodules and ETTs. The percent of cyclin E-stained trophoblastic cells in an atypical placental site nodule is in between a conventional placental site nodule and an ETT, further supporting the aforementioned hypothesis (22). Moreover, in some cases, there is an intimate association of an ETT with a placental site nodule. Nevertheless, molecular genetic studies are necessary in order to confirm this hypothesis.